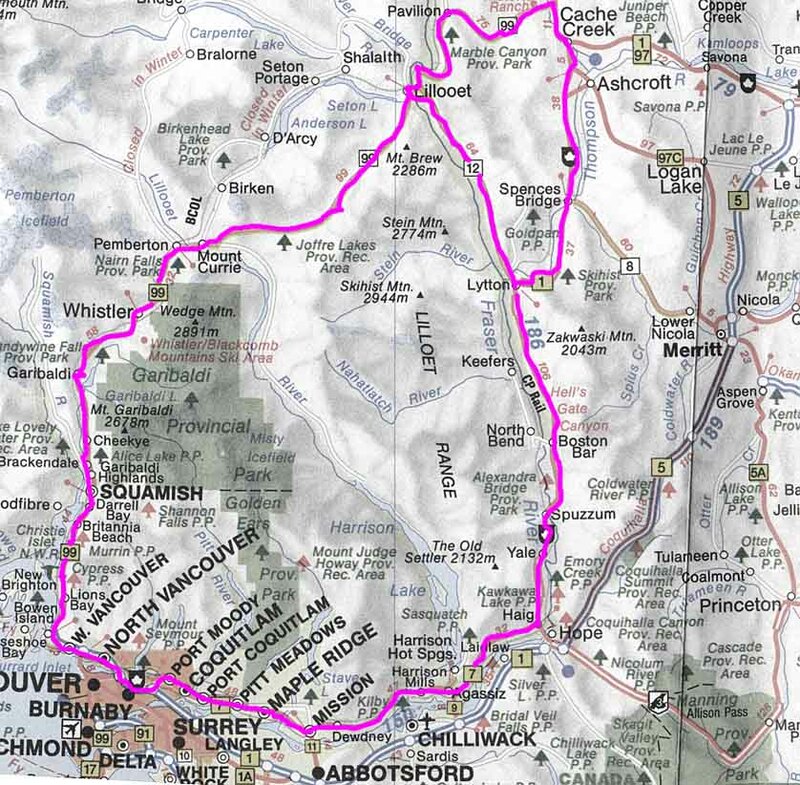 So, on Friday after work, we went toward Squamish, Whistler and Pemberton. The plan was to spend the night in Pemberton in a nice little hotel and in the morning continue toward Lolloet. There is a nice pub with a good food in Pemberton, so it was another reason to stay there 😀 The rain was pouring and mountains were covered in clouds but we didn’t care: after good dinner we sat in a hot tub for a while then went to sleep. The long day was in front of us. Morning was a bit better, parts of blue skies could be seen here and there; roads were almost empty so driving was pleasant, giving us opportunity to stop wherever we want, to take photographs or just to enjoy the nature. First stop was on Joffre lakes. few ospreys and bald eagles. 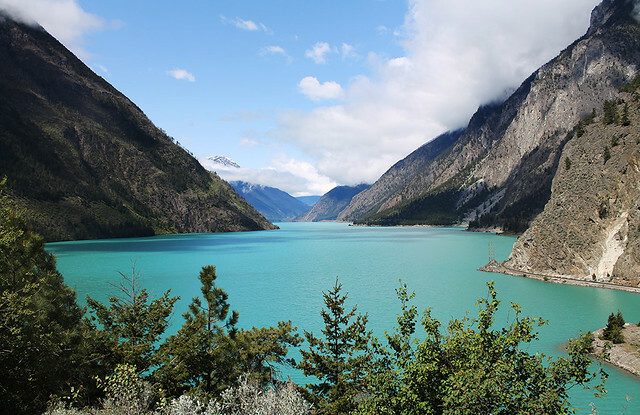 We stopped few more times before Lillooet because landscape was beautiful. Just before Lilooet another big lake: Seton lake with nice viewpoint and temperatures of almost 20C. We were approaching one of the warmest regions in Canada (along with Lytton and Osoyoos) and landscape changed rapidly. From that point the road is following Fraser river, probably one of the most important rivers in British Columbia. 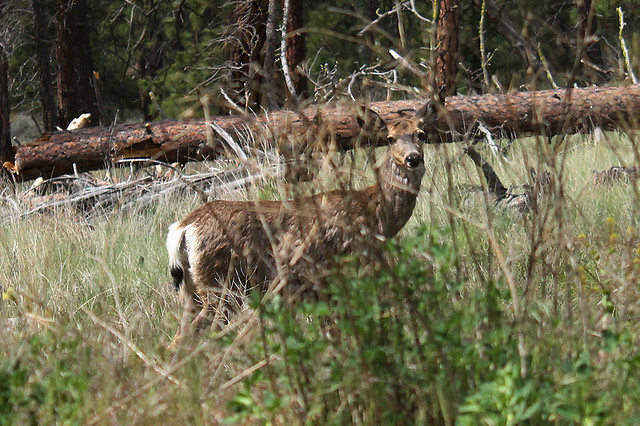 A lot of mule deer were carelessly grazing near the road, even though grass looked dry and it seemed there was not much to eat around. We’ve made a short stop in Lytton and continued toward the place I was very interested about: Hell’s Gate. Hell’s Gate is part of Fraser river canyon and, as with a lot of other parts in BC and Canada, it has it’s history connected with a history of development of Pacific Railway and Canadian west. In 1913. while blasting its way through the canyon with dynamite, Canadian National Railway workers caused a big rock slide to a narrow part of the canyon. At the beginning, it didn’t look like a big damage but later it became more obvious. 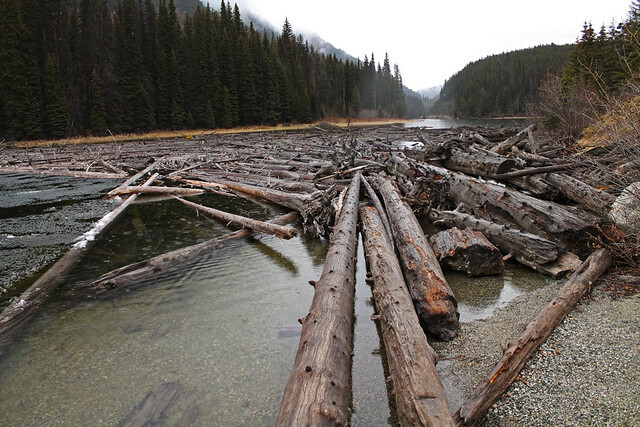 Fraser river was and still is one of the important routes for Pacific salmon to reach Thompson river and spawn. The problem was because the river, suddenly going through pretty narrow canyon, was too fast for salmon to pass so in next year a significant drop in salmon occurred. That created a tension between Canadian government and Aboriginal tribes. At the beginning, they’ve tried to use some kind of nets to catch salmon and move it more upstream; but salmon is having the urge to fight rivers upstream in its genes, so help was not really a help; some of them would end up “confused” and just return the same way downstream. Both Canadian and US governments created Pacific Salmon Fisheries Commission (IPSFC) (now the Pacific Salmon Commission). After intensive research, they recommended that fishways should be made, concrete tunnels that will slow the river a bit thus helping salmon to pass further up the river where stream was not as strong. Building of fishways started in 1944 and now there are three of them with plans to make one more. 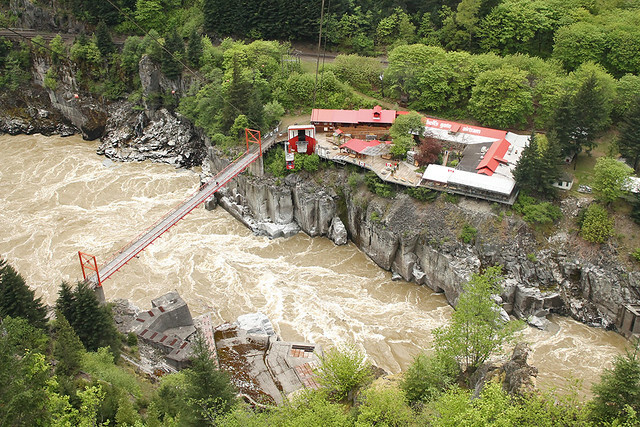 Video of Hell’s Gate and Fraser river. A nice post, Dare … making me envious; I’ve been pretty well imprisoned here this year, and the wife has had health problems, to make it worse. I loved the shot of the bear; he’s a beautiful colour! 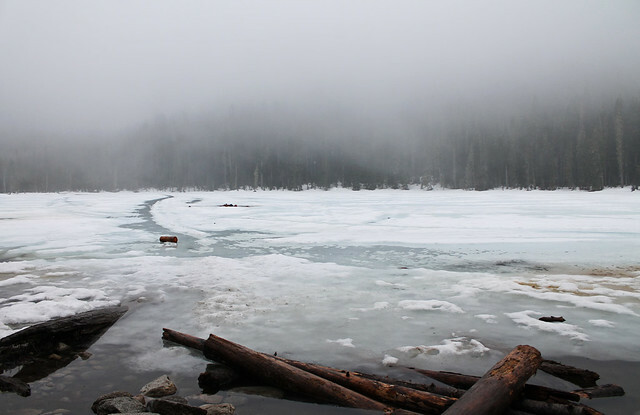 The mist over Joffre Lake is a fantastic shot, and the mountain emerging from the clouds is mythic. And the last shot is a nice closer. Such beautiful photos! Stunning. The mule deer is so cute, as is the snowshoe rabbit. But, that bear is looking too close for comfort! I did not know. I thought on a dirt road amid cabins it would be fine. There was a gravel pit where bears were seen; even in our friends’ yard at the bird feeder. Thankfully, I got out to the highway and crossed to be barked at by a farmer’s dog. 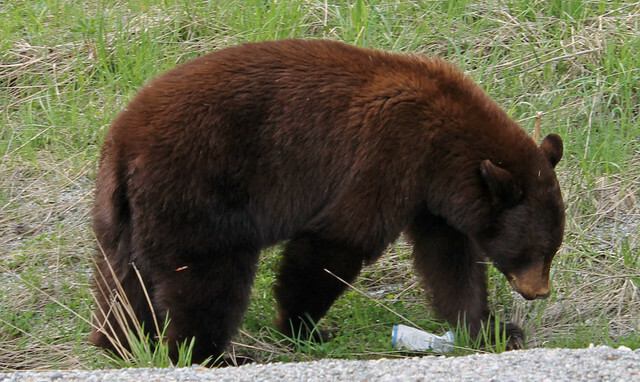 Farmer so and so came out and walked me beyond the gravel pit as he mentioned a mama bear had had cubs… He was concerned I get to the more civilized area. Nice man to help me out. Yes, I was indeed blessed to come home with a story to tell and unscathed. Great post and pictures… One of these e days I’ll get myself out of Ontario and have a better look at the rest of Canada. sprytely50, I am in BC for less than 3 years but was lucky to see a lot – still a lot to see, though. I’ve been in Banff in Alberta, Yoho and Glacier National Parks and many other places, mostly on south of BC. There are so many places yet to see in BC only, not to mention rest of Canada. I would like to go to Nova Scotia and Newfoundland one day, too. Dare, are your folk in Serbia all OK? Yes, they are. My mom lives close to Danube but every seems to be fine at the moment. Thank you. Wow! it looks like a very nice adventure. The Rockies are such a nice playground. Thanks, my family is ok.
the Hell’s gate the photo reflect precisely this name , but i think it is a kind of cold hell . Let’s look at the subject from a comic viewpoint ,imagine if that salmon held a meeting in that frightening valley and decided not to accept the new circumstance ,and end they get what they want . It’s the same with humans. They have a single can of beer and then they’re crawling on all fours instead of walking, roaring at passers-by and ignoring the litter they just dropped. Your blog always fills me with awe and envy. And I almost always learn something new. Then you should prepare yourself to stay for a long time 😀 So many things to see. Great post and photos Darko! You and San sure have seen a lot! I really enjoyed the information about the fisheries.